Bartolomeo Cristofori, of Padua, Italy, is undisputedly credited with being the inventor of the piano. But he was actually striving to produce the first harpsichord to offer a touch responsive keyboard. Pressing a harpsichord’s key causes a small plectrum to pluck a string, but this mechanism (or action) won’t enable control of the note’s volume. At the end of the 17th century the holy grail of the harpsichord industry was to build a keyboard instrument that could add expression to a performance. Cristofori realised that to achieve this, he would need to ditch the plectrum and use hammers to strike the strings. He developed a revolutionary new action that propelled hammers towards the strings with a force proportional to that applied to the keys. In effect this was a mechanised dulcimer. So the “gravicembalo col piano e forte” (harpsichord with loud and soft) was born. It subsequently became known as the pianoforte. Such was the quality of Cristofori’s design that the oldest surviving of his instruments, produced in1720, is still playable today. It takes centre stage in a new exhibition entitled “The Art of Music through Time” at New York’s Metropolitan Museum of Art. The Met houses its extensive collection of musical instruments in the André Mertens Galleries. These four galleries (numbers 680, 682, 683, and 684), all on the second floor, have just reopened following a major two-year renovation and redesign. The stunning new displays give visitors a more insightful narrative into one of the world’s most diverse and important collections of musical instruments. Gallery 680 “Fanfare” explores brass instruments from around the world. Gallery 683 “The Organ Loft” features the 1830 Thomas Appleton organ. Whilst gallery 682 “Instruments in Focus”, opens in 2019, and will serve as a space for special installations of instruments from the Met’s collection. However it is in gallery 684 that one finds “The Art of Music through Time” exhibition. Here instruments are organised chronologically illustrating that “people worldwide have simultaneously created extraordinary music and instrument for millennia”. The exhibition includes instruments dating from the early 1st millennium BCE – the Openwork rattle bell, to 2017 with one of the museum’s most recent acquisitions the E-pa – a form of electric lute. And here you will find the Cristofori instrument prominently displayed. It also features on the exhibition’s audio guide. The Cristofori piano is actually part of the museum’s “Crosby Brown Collection of Musical Instruments”. In 1876 Joseph Drexel, a partner of J.P. Morgan, and collector of musical instruments, retired to devote his time to charity. In 1885 he decided to gift his collection of 44 ancient stringed musical instrument to the Met. This collection attracted other donations, most notably from a Mrs Elizabeth Brown. She had started her collection by purchasing several instruments from Florence for her music room in New Jersey, and continued to add to it. Over time she gifted all her instruments to the Met. 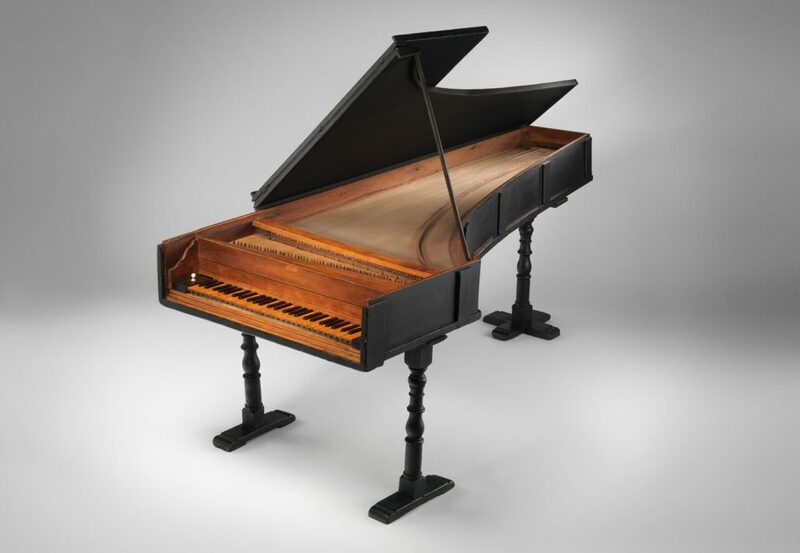 One of Brown’s acquisitions was the 1720 Cristofori piano, then one of only two known existing pianos by the maker. Signed by Cristofori, it was sold to Brown as the second piano he had ever made. It turned out to be the world’s earliest surviving piano. Cristofori, however, is believed to have built his first piano in 1700. Today, there are three known Cristofori pianos in existence, but only The Met’s instrument is currently playable. Elizabeth Brown’s donation became the “Crosby Brown Collection of Musical Instruments”. It was named after her husband because “no lady wanted publicity around her name”. When she died in 1918, the collection consisted of over 3,600 items.